Flexible-Film Isolators for Bio/Pharmaceutical Production Including Compounding, Milling, Weighing and Aseptic Testing! CBC's Flexible Film Barrier and/or Containment Isolators are both Durable and Economical. 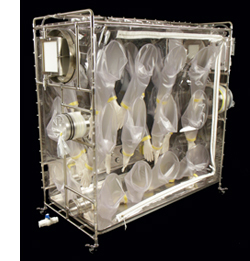 Pictured above is a Negative Pressure Flexible Film, Barrier and Containment Isolator that is designed to provide a controlled production environment for the Bio/Pharmaceutical industry. Dealing with cytotoxic, lyophizilation or biological materials. Single or double HEPA filtered exhaust air. Mobile systems with two-way locking casters. 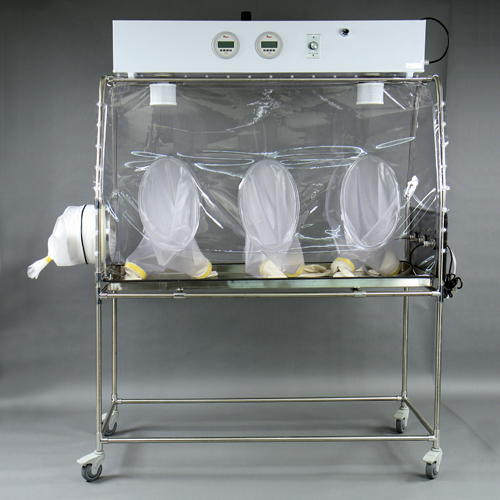 Each flexible, barrier isolator system comes with a HEPA filter on the inlet and exhaust. An attachment can be added to the exhaust filter housing to allow for exhausting into the building's exhaust system. Alternatively, a second HEPA filter can be added to the exhaust system to allow venting back into the room. ULPA filters are also available. The transfer port systems come in stainless steel, acrylic, or polypropylene. The design can be the conventional system with two (2) removeable vinyl caps, a bag in and bag out system; or a rapid transfer port system. If you are not sure where to begin or what you need, we can help you through the planning process including DQ, IQ, OQ and PQ. NOTE: Our flexible barrier and/or containment chambers can be radiated if required! Tag words: gbarrier isolator, pharmaceutical isolator, pharma isolators, compounding isolators, flexible film isolators for pharmaceutical production, semi rigid isolators for animals, clean rooms, cleanrooms, containment units, flexible film decontamination chambers, polypropylene decontamination chambers, glove boxes, animal science, animal research, biotechnology, pharmaceutics, phamaceutical production, phamaceutical, biopharmaceutics, class biologically clean, canopies, sterilizing, steril, hypoxic, anaerobic, contamination, drug discovery, drug development, pathogenic protection, biomodules, modular clean rooms, HEPA filters, lap seam seal, housing for nucleus colonies, housing for foundation colonies, housing for laboratory animals, aseptic research, labs, microbial, immunodeficient, defined flora rodents, defined microflora animals, altered schaedler flora, antimicrobial peptide, axenic, axenic animals, genetically engineered animals, transgenic rodent models, barrier isolators, aseptic isolators, compounding isolators, isolation chambers, animal housing, vinyl anaerobic chambers, incubators, cabinets, hypoxic chambers, environment controlled containment, glovebox, containment solutions, biological security, flexible plastic isolators, pharmacy equipment, laboratory equipment, transfer ports.